How do you imagine the future of technology will look like, how much will improve our lives and in what manner? Well, New York based glass manufacturer Corning Incorporated, the world leader in specialty glass and ceramic, wants to take the use of glass to a whole new level showing us a stunning concept of glass technology of the future, changing the way the world thinks about glass. With nearly half a century of major glass innovations and high-value customer collaborations, Corning Inc. sets already the standard in some advanced display products with its renowned Gorilla Glass® that is being used in the new iPhone 4, iPhone 4S, iPad 2 and a few other iOS devices. Visually impressive, highly damage-resistant and lightweight, this cover glass helps protect them from everyday wear and tear. But the advancements with this glass technology is far ahead our expectations we think. Through this essential material it will make possible a new world featuring displays and sensitive touch surfaces with complex electronic circuits and nano functionality which can scale for large applications such as television, computers, handhelds, wide screens anywhere you want: at home, school, work, hospitals and shopping. Corning’s vision on the future is based on the use of a flexible and thin glass as a computerized touch cover on any surface possible from walls, doors, refrigerator, tables and so on, turning it into smart sensitive touch displays that will function like today’s world’s coolest devices: importing, studying, implementing, storing, transfering, capturing and presenting data. To allow such things happen on a large scale, this flexible glass will have special characteristics like moisture permeability, temperature tolerances and clarity of glass, but the flexibility and low cost of plastic. This amazing futuristic concept will become commonplace thanks to nowadays advancements in technology. Even it looks crazy to see this kind of technology being rolled out as widely as in this video, find that some of the technologies shown here are already distributed to a degree, some of them are in development and others will take of course more time. We don’t know what you expect from the near future but for sure the progression of science and technology is going to digitize more and more our society, which will inevitably go towards in this direction. 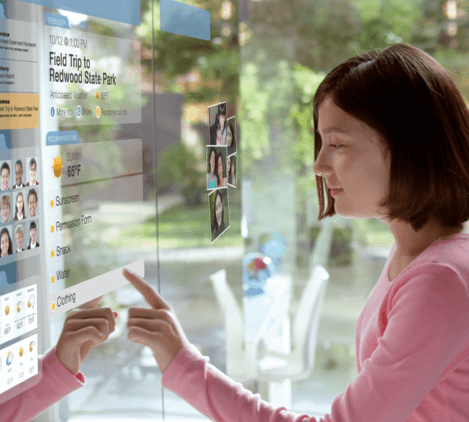 Here you have their two inspiring videos introduced to the world not so long ago which showcase the daily use of Corning glass in the future, what will be possible if their current research comes to market. What do you think, how far is this advancements for us? Wouldn’t you want such amazing technology at your home, school and work?